Jada Williams hitting the winning free throw for Gloucester Catholic. It was the second year in a row this game had gone into overtime. Same gym. Same weekend in January. Still the most raucous and entertaining performance of the annual Seagull Classic at Holy Spirit High School. 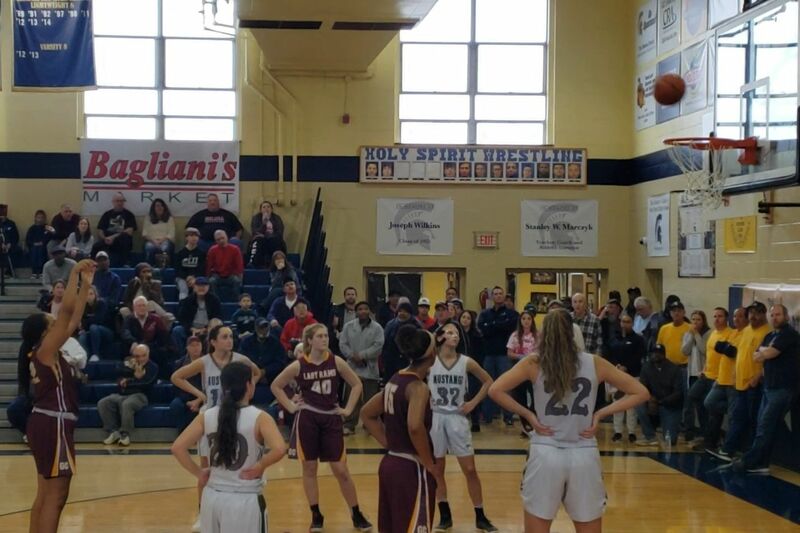 Jada Williams said her Gloucester Catholic basketball team went into Saturday afternoon’s matchup wanting revenge after losing to Mainland in double OT last year. Of course, none of that was on her mind when she walked to the free throw line with the game tied and 4 seconds left in the extra period. The sophomore forward calmly sank both free throws to ice a thrilling 60-58 come-from-behind win for her Rams, who dealt Mainland its first loss this season. Just as last year, this game was was billed as a showdown between the Rams’ Azana Baines and Mainland’s Kylee Watson — both among the most highly regarded high school players in the country. Watson finished with a game-high 25 points, eight rebounds, six blocks, and six assists. Baines finished with 13 points, three rebounds, and three assists. But Baines’ supporting cast stole the show. Williams was 4-for-4 from the line in overtime and scored six of her 14 points in the extra period. She also chipped in 11 rebounds. The game’s MVP award went to junior Mycala Carney. The diminutive, speedy point guard played with fire, leading her team with 20 points and four steals. She also forced a key turnover off a 5-second call in overtime. She scored 12 points in the first quarter, and her energy never dropped, particularly during the Rams’ pivotal defensive stands, which helped erase sizable deficits at the end of the third and fourth quarters. A three-pointer by Madi Hafetz gave Mainland a 42-31 lead with 6 minutes, 53 seconds left in the third quarter. That’s when the Rams (6-1) opted for a man-to-man fullcourt press, and the game’s momentum shifted. Baines capped an 8-0 run with a tough basket in the paint in the final second of the third quarter to make the score, 44-42. Mainland (8-1) again pulled away early in the fourth quarter and was ahead, 50-42, with 3:44 left. But the Rams again switched to a fullcourt press and again took back momentum. Three-pointers by Caitlyn Cordery and Lynzie Eggers were daggers during a frantic 10-2 run that sent the game into overtime. Watson, who did everything in the game, scored all six of her team’s points in overtime. It wasn’t illustrative of a performance in which she was most impressive with how she shared the ball. Defensively, Watson helped frustrate Baines during an all-out effort to double- or even triple-team the star guard. It was a big reason reason why Baines’ performance, while solid, wasn’t her best showing. But, she said, that’s what teammates are for. GC: Mycala Carney 20, Jada Williams 14, Azana Baines 13, Lynzie Eggers 10, Caitlyn Cordery 3. M: Camryn Dirks 13, Kylee Watson 25, Madi Hafetz 6, Taylor Dalzell 11, Claudia Mairone 3.